What is BritBox? The new BBC and ITV streaming service explained | What Hi-Fi? A new TV streaming service is on the horizon, and it's more British than a cup of builder's tea. BritBox is a joint effort from terrestrial broadcasters the BBC and ITV. It aims to bring together the best of British TV, including comedy, drama, soaps, factual programming, light entertainment and everything else in between. But it has its work cut out. Streaming has completely changed the TV landscape in recent years. Netflix currently dominates, with around 140 million customers worldwide, but there's strong competition from Amazon Prime Video, as well as US-only rivals Hulu, Sling, HBO Now and CBS All Access. And the field is only going to get more crowded. Tech giant Apple is poised to launch its own streaming service, Apple TV+, while Disney+ will also launch before the end of the year. Apple TV+ offers exclusive content from the likes of Steven Spielberg and Oprah, while Disney+ brings together Disney's awesome back catalogue, plus its Marvel and Star Wars properties. It will also be cheaper than Netflix. • Amazon Prime Video vs Netflix - which is better? It's a new streaming service from both the BBC and ITV. It promises to bring together the biggest collection of British TV content ever found on a streaming service, combining current and classic boxsets for viewing on-demand. BritBox will also be investing in the creation of brand new original content, much like Netflix Originals. Basically, BritBox is the BBC and ITV's rival to Netflix. The service will be ad-free, and talks are ongoing about bringing more content partners on board. In fact, Channel 4 CEO Alex Mahon has confirmed that the broadcaster is interested in joining BritBox. In March 2019, she told an industry conference: "Of course, we are having positive and constructive discussions with ITV and the BBC about how Channel 4 could partner with them to build the scale of BritBox." So we could see Channel 4 shows like early Black Mirror and Humans available on BritBox. It is in the UK but it actually launched in the US back in 2017, where it has racked up half a million subscribers. The UK launch has been a long time coming. Back in 2008, the BBC, ITV and Channel 4 teamed up to launch a joint streaming service called Project Kangaroo, but it was deemed anti-competitive by the Competition Commission. Eleven years later, that seems less of an issue, probably because of the inexorable rise of Netflix. What content will BritBox show? It's a mix of old and new shows from both the Beeb and ITV. Recent series include Tutankhamun, Cold Feet and Silent Witness, along with soaps like EastEnders and Emmerdale. These join classics like Pride and Prejudice, Inspector Morse, Keeping Up Appearances and Fawlty Towers. We would be amazed if Only Fools and Horses wasn't also available. The BritBox website also shows recent fare from both broadcasters, including period drama Victoria and serial crime drama Broadchurch. So far, only McMafia, Last Tango in Halifax, Les Misérables and Gavin & Stacey have been confirmed for the UK version. Both the ITV and BBC have extensive back catalogues, so expect BritBox's content library to go deep. The service will also commission its own original content, though there's no word on exactly what this will entail. While it would be great to see world-class productions, neither broadcaster has pockets as deep as Netflix, so don't expect lavish big-budget efforts to rival The Crown. How does BritBox compare to iPlayer? Hang on, you might be thinking, surely I can get all this on iPlayer and ITV Hub? Some of it you can, but not all. Recent shows are added to both services but they disappear after 30 days. You also can't get the classic shows. iPlayer has a smattering of classic boxsets (like Blackadder II, at the time of writing), but it's fairly random in what it decides to make available. With BritBox, you'll have access to those vintage shows for an extended period of time. BritBox doesn't have adverts either. That's not a problem on BBC iPlayer, but ITV Hub has more than its fair share of ads. At the moment, to watch ITV shows without ads you need ITV Hub+, which costs £3.99 a month. 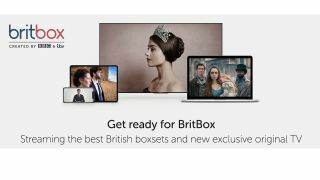 What devices will BritBox work on? In the US, BritBox is currently available as an app on iOS and Android, as well as on Roku, Apple TV and Google Chromecast. Expect this list to grow when it reaches these shores - we would expect to see it on games consoles like the PS4 and Xbox One, for example, as well as smart TVs made by the likes of LG, Samsung and Panasonic. When does BritBox launch in the UK? This hasn't been confirmed. According to the press release put out at the end of February, BritBox hopes to launch in the second half of 2019. Though it's worth noting that the BBC and ITV are in "the concluding phase of talks", so it's not yet a done deal. The service will also need to get the green light from the Competition and Markets Authority (which has since taken the place of the Competition Commission) and media regulator Ofcom. How much will BritBox cost? As for the BritBox price, all we have is "competitive". Netflix starts at £5.99 a month in the UK for the basic package, so we would expect it to come in under a fiver. Even considering the heaving back catalogues of both the BBC and ITV, it would be insane for BritBox to charge any more than that, considering all of the BBC and ITV's current shows are available for free on their respective catch-up platforms. The reaction has not been overwhelmingly positive. Writing in The Guardian, media commentator Mark Lawson calls BritBox "hugely risky", and points out the many challenges facing the service: deep-pocketed US rivals; the fact the BBC doesn't 'own' most of its hit shows as they're made by independent production companies (some of which are actually part of ITV Studios); and the fact the BBC also can't spend licence fee money on the service. It's an uphill road ahead, then. We'll be updating this page with more BritBox news and developments as they happen.